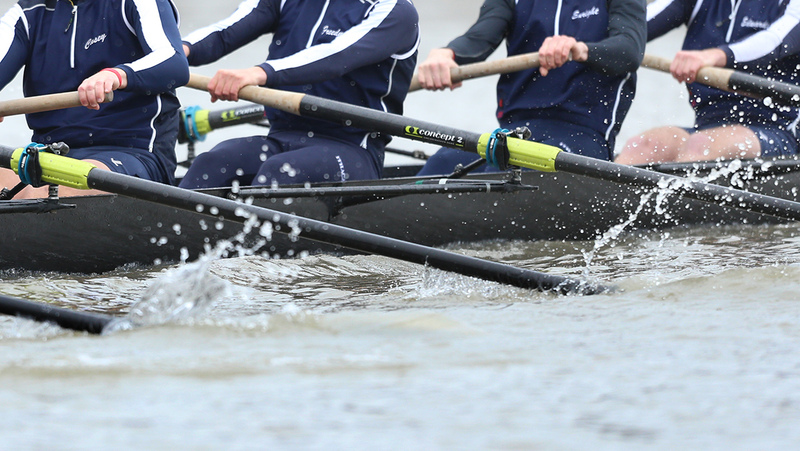 The Ithaca College women’s rowing team competed against the Rochester Institute of Technology and the University of Rochester on April 6 at the Cayuga Inlet. The Bombers started the day with a win in the second varsity eight squad’s race. Junior coxswain Olivia Southworth, freshman Dania Bogdanovic, sophomore June Fortner, junior Allison Ritting, senior Greta O’Hara, senior Kelly Csernica, sophomore Nicola Vigliotti, junior Liza Caldicott and senior Ella Sarachan won with a time of 7:23.9. The third varsity eight squad with sophomore coxswain Michele Hyland, sophomore Devi De Oliveria, senior Sophie Westfield, sophomore Noa Covell, sophomore Samantha Spisak, sophomore Haana Suero, sophomore Kiera Peterson, junior Leighanne Sullivan and sophomore Mikayla Henry raced to a time of 7:55.1, claiming third place. RIT’s boat took second place with a time of 7:33.5. In the first varsity eight squad’s race, junior coxswain Jennie Brian, senior Savannah Brija, sophomore Sarah Snow, junior Libby Ryan, freshman Izzy Ozkurt, sophomore Mackenzie Morean, senior Sierra Keat, sophomore Allison Arndt and sophomore Lauren O’Dell claimed a victory with a time of 7:02.02. RIT placed second with 7:12.8, and Rochester finished third at 7:45.9. In the last race of the day, the novice eight, composed of freshman coxswain Emily Lighthall, freshmen Edie McRoberts, Kelsey Lavin, Cyerra Adams, Laura Trainor, Erin Traut, Autumn Michels, Emmy Repetti and sophomore Maria Caminiti finished with a time of 8:06.6, taking first place. RIT finished in second at 8:30.1 while Rochester came close with 8:31.1, giving them third.